Thick, warm, luxurious, our SockShop of London Mohair Knee High Socks will make the ideal accompaniment for anyone who needs the added comfort and protection of full loop pile cushioning, or who just enjoys the natural feel of mohair! 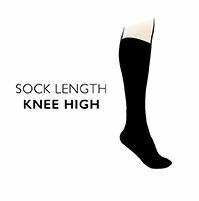 These knee high length socks, made here in the UK, make great activity wear for our ‘testing’ climate, highly suitable for walking, skiing, climbing, or indeed, any outdoor activity. We chose mohair for these Knee High Socks not just because of its silky, luxurious feel, but because of its durability and superbly versatile insulating properties, warm in winter but remaining cool in summer thanks to its moisture wicking properties.